Above: A welcoming beginning to the meal. Below: The chili fries come with cheese and onion . Below: A Rocket Double with Bocca soy burgers. Above: The Royal Caribbean Oreo Sundae. Below: Apple pie ala mode. Above and below: The staff takes to the aile to perform for the guests. The Johnny Rockets on Explorer is a franchise of the Johnny Rockets restaurants found on shore. Johnny Rockets describes itself as a restaurant chain providing "the food, fun and friendliness reminiscent of feel-good Americana." It would have been no problem for Royal Caribbean to have built a hamburger venue of its own creation on Explorer - - many ships have hamburger venues. The fact that Royal Caribbean did not do so is a clue that this restaurant is envisioned as something more than a place where you go when you just want a burger or any of the individual items on the menu. Indeed, the pricing structure does not really lend itself to just stopping in for a milk shake. Rather, the Johnny Rockets on Explorer is a package experience. The setting for this experience is a recreation of a mid-20th century American diner. While Johnny Rockets does have an outdoor section, to get the full effect, you should walk through the diner's glass doors into the interior. There you will find booths with red vinyl seats opposite a long counter made of white tile and chrome trim. Juke boxes dot the landscape and hits from the '50s, '60s and '70s play continuously. The staff too are in period costume including paper hats and long white aprons over their bow-tied white shirts and black trousers. The entertainment begins as soon as one of the staff sees that a newcomer has entered the diner. "Everyone say 'hello" and waiters, waitresses, cooks, supervisors and often the other guests chime in with the greeting. A similar chorus occurs whenever someone exits. A waiter or waitress then accompanies you to a seat of your choosing. He or she explains the menu. As much food as you want in included under the $4.95 cover charge. The beverages - - soft drinks, milk shakes, floats, soda, beer etc. - - cost extra. Your order is then taken in the same upbeat smiling style that the staff display in all their interactions with the customers. Each meal begins with a plate of French fries and fried onion rings accompanied by a small bowl of tartar sauce. However, the server then takes the ketchup dispenser and draws a smiling face on an empty plate - - just another part of the entertainment, part of the fun atmosphere. You can order additional side dishes. One that I particularly enjoyed was the chili French fries. The fries are intermingled with the chili. When it arrives at the table, there is shaved cheddar cheese and sliced onion on top. These should be mixed in amongst the chili fries so that the cheese melts and the flavor of the fresh onion mingles with the other ingredients. The Rocket Double is an outstanding main course. It consists of two large beef patties, two slices of cheddar cheese, lettuce and tomato on a hamburger bun together with Johnny Rocket's "special sauce." Although the cheese burgers served elsewhere on Explorer are good, this is a burger amongst burgers. As an alternative, you can have a vegetarian Bocca soy burger either in its own sandwich (called the "Streamliner") or in place of the beef patties in the other sandwiches. The veggie version of the Rocket Double has a different flavor than the beef version but is nonetheless a good sandwich. Other alternatives include hot dogs, grilled chicken breast and a variety of sandwiches including tuna salad, ham and cheese, grilled cheese and a chicken club. After completing the main course, you have the choice of two desserts. The Royal Caribbean oreo ice cream sundae is a classic, with whipped cream, a cherry and chocolate sauce over a good vanilla ice cream. However, what makes it special is the ground oreo cookies that coat the bottom of the glass. A very popular alternative is the apple pie ala mode. The slice of pie I had was warm and fresh and was complemented nicely by the vanilla ice cream. At some point during the course of the meal the background music becomes louder and the servers assemble in the aisle between the counter and the booths. At a signal, they break into a line dance. Most of the time, the patrons just watch and smile but on occasion one or two join in the dancing. If the restaurant is very busy, the dancing is done less frequently. Thus, it is better to arrive during an off-hour rather than at the popular meal times. On Explorer, the Johnny Rocket's generally opens at 11:30 a.m. on sea days (1:30 p.m. on port days) and closes at 11:30 at night. While we are on the topic of music, the juke boxes in the booths and along the counters actually work. They are operated by nickels - - one song for five cents. In keeping with Explorer's cashless society, my server provided me with a supply of nickels. Your choices then go into the queue and are played eventually. While hamburger restaurants are often linked to kids and family dining, Johnny Rockets is clearly for the young at heart. 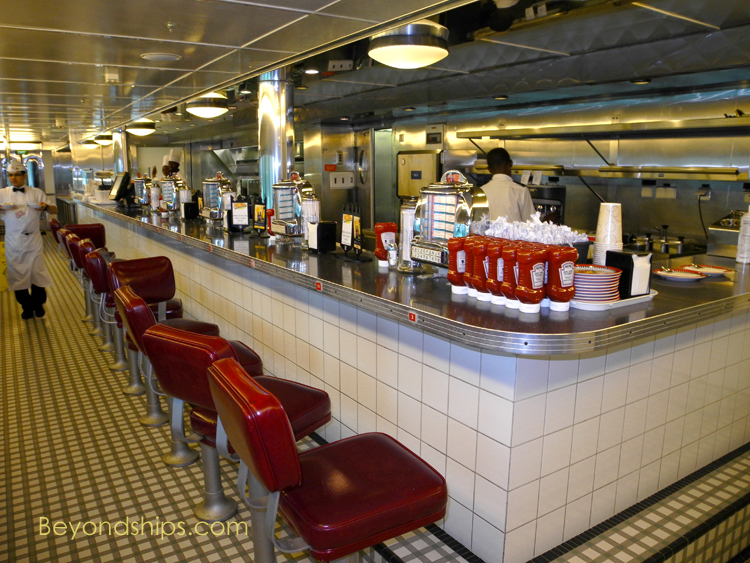 In fact, during my last cruise on Explorer, each time I visited, all of the customers in the Johnny Rocket's were adults. 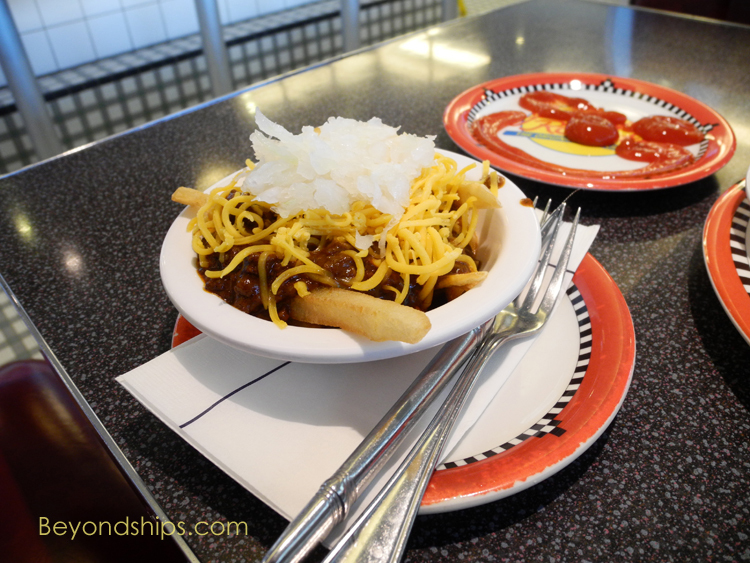 The Johnny Rockets on Explorer of the Seas is not a gourmet fine dining experience. It is not meant to be. The menu items are excellent versions of familiar American classics. However, the experience is just as much about light hearted fun as it is about food. It transports you back to another seemingly less complicated time. Was there such a diner back then? Probably not, but there should have been.